Today is National Cereal Day (which should be every day in my book) and we wanted to celebrate by getting a better idea of what type of cereals our users enjoy. Are you a Frosted Flakes aficionado? I heard they're GR-R-REAT! Maybe you're a Lucky Charm-er, a Grape Nut nut, or a fan of bran -- we won't judge (too much). Or maybe you have a special way of fixing up your bowl of cereal. Either way, join the conversation. Years ago I used to enjoy fruity cereals such as Froot Loops or Fruity Pebbles with orange juice. Don't worry I'm no longer in that phase. I now enjoy Honey Nut Cheerios and usually snack on them dry. Re: It's National Cereal Day! Put freeze dried bananas on the bottom of a bowl. Add Strawberry Frosted Mini Wheats. Oh, there are so many! But, my go-to cereal is Honey Bunches of Oats with Crispy Almonds. 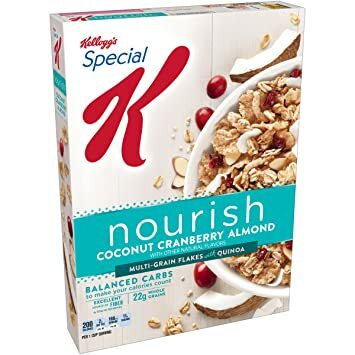 It's another great cereal you can eat dry or with almond milk and enjoy! Not a milk-drinker, though. That is weiiiiiiiiiiiiiiiiiiiiird. I occasionally eat granola but mostly steel-cut oats. Yeah, I know, boring. Most breakfast cereals have about as much nutritional value as a jelly doughnut. I remember when I was a kid, I was addicted to Honey Combs. I did switch to Reese's Puffs for a while. Love those too! Froot Loops will always have a soft spot in my heart (probably literally). I had a few cereal favourites as Alpha-Bits, regular Cheerios, and CoCo Puffs. Being an Air Force family growing up in the late '50s to the entire '60's we weren't poor as my dad was a tech sergeant My main breakfast was eggs, bacon, toast, and coffee. Oh, once in awhile we got oatmeal (UGH!). However, as I got older, like in the last 15 years I eat old fashioned oats with 2 cinnamon-raisin english muffins almost drenched in REAL butter! I eat that twice a week. BTW, is there ANY margarine decent to use?